Our Inside Axon blog series is updated every Wednesday and features letters from executives within Axon. This week's post was written by Bill Denzer, Axon's VP of Manufacturing. Check again next week for more experiences and insight from Axon leaders. If you’re thinking about how you manufactured yesterday, or how you’re manufacturing today, you’ll never have time to think about how you’ll manufacture tomorrow. A simple concept, but a surprising amount of manufacturing leaders focus on how they performed last quarter instead of asking themselves what they’ll do differently next quarter. If you can answer these two questions, your chance of success will be exponentially higher than those who just go forward with no plan and no vision for the future. At Axon, we’re challenging ourselves to answer those questions by setting a goal for the future of our Manufacturing team and devising a path to get there. Sure, there will be challenges along the way and we may need to shift courses, but the vision of accelerating innovation to drive improvements in manufacturing remains on target. Our mission is to utilise technology to improve the quality and reliability of our products and deliver them at the time our customers demand. We know where we want to be in five years. Do you? 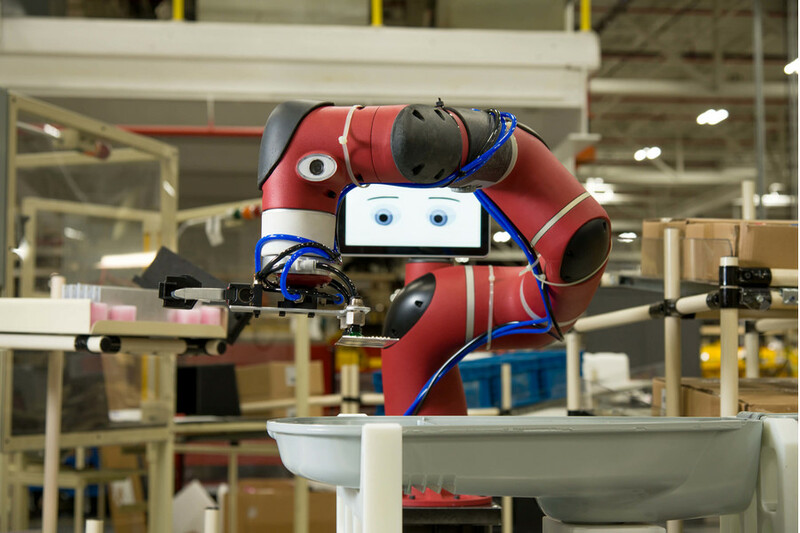 Courtesy of Rethink Robotics, Inc.
Cobots are lighter, cheaper and consume less power than traditional industrial robots, but what sets them apart is their safety and ease-of-use. They work side by side with humans and are designed to enable non-expert users to train them in just a few minutes. Many cobots are also outfitted with advanced sensor systems that enable off-the-shelf functionality. Camera-integrated cobots can recognise and track objects, and the force-sensing that drives the robots’ soft touch can also be applied to part fitting and assembly. Advances in adaptive gripper technologies also enable cobots to grasp a wide variety of different objects gently yet firmly. Most collaborative robot installations see a return on investments within one year, and are also easily repurposed to other jobs as priorities change. Lean Manufacturing is nothing new, but how we apply it at Axon is. Lean focuses on eliminating waste and improving workflow, and waste is defined as anything that doesn’t add value to the customer. Companies that focus on Lean reduce costs, increase productivity and have higher customer satisfaction. At Axon, we’re obsessed with our customers and we hate waste! We focus on reducing eight forms of waste to constantly improve the customer experience. A recent Gallup survey, ‘State of the American Workforce’, showed that only 33% of American workers felt engaged, while the world’s best performing organisations show engagement levels at 70% on average. At Axon, our Manufacturing employees are a valued asset that is vital to our success. We give them ownership of their product cells and allow them to make decisions that positively impact the customer experience. A recent survey of Axon employees showed an engagement level of 78%. To help drive engagement, performance data is posted at the entrance to each product cell, which promotes data-driven decision-making. This improves the quality and reliability of our products and gets them in the hands of our customers faster. Support functions from Manufacturing Engineering, Quality Assurance and Supply Chain have dedicated individuals as part of the product cell that also drive continuous improvement activities. While culture has been a big buzzword in Silicon Valley, it’s also becoming more important for manufacturers to adopt their own culture. At Axon, we’re reaping the benefits of an open culture that not only encourages but expects its manufacturing personnel to identify problems and help develop innovative solutions to those problems. Last year 70% of Axon manufacturing personnel submitted an operational improvement idea. We’re obsessed not only with our customers, but also with creating a manufacturing environment that encourages open communication between our manufacturing personnel and their managers. Manufacturing management sit in the same manufacturing space as the workers, which allows for collaborative decision-making and improved teamwork. We also regularly hold open office hours for manufacturing personnel to meet with the head of Manufacturing to improve communication and break down any perceived barriers. We are proactive rather than passive – we don't simply wait for ideas to roll in. We challenge teams with a specific issue, let them break out into small cross-functional groups to brainstorm a list of possible solutions, and then let them test their suggestions until they find one that works. When Axon manufacturing workers identify a problem as well as a potential solution, they submit their idea through the Axon Continuous Improvement process (ACI). ACI forms are available in each product cell, and as they go through the review and approval process, status updates are clearly visible to the initiator. A transparent system is critical to idea generation. Otherwise, valuable employee suggestions for improving productivity, cutting costs or otherwise boosting the bottom line may get lost in the shuffle. Nowhere does the principle that two heads (or 10) are better than one apply more than in a manufacturing environment. That's why teamwork is a cornerstone of the Axon manufacturing culture. We call it ‘Joining Forces’. It creates cohesiveness, increased motivation, promotes communication among people in different groups who don't know each other well, and builds problem-solving skills that carry over to the real-life manufacturing environment. Showcasing positive results from employee improvement ideas not only boosts morale but also keeps the company's interest in worker input in the spotlight. Recognition methods at Axon range from company meeting ‘shout outs’, to cash awards for idea/solution generation, to team lunches with management. At Axon, we know where we want to go and how our Manufacturing team is going to get there, and we found out by asking ourselves the question, ‘how can we integrate our plans for tomorrow into our goals for today?’ Answer that, and you're already halfway to success.